These events in the greater Cleveland/Akron area are the perfect way to celebrate an extra day off of work, and take time for extra fun with the whole family. 1. If you need to let your creative side run free… Attend the Made in Ohio Arts and Crafts Festival. This event takes place at Hale Farm and Village August 31-September 2 from 10 a.m.-5 p.m. Enjoy the beautiful weather in this outdoor rustic setting, and explore the Hale Farm and Village homes. The craft fair is done by all local artists, and there will be music and art demonstrations throughout the day. 2. If you are a true foodie… Eat your way through the Taste of Hudson, which takes place September 2-3. Many Hudson restaurants gather on the square and serve all of their best dishes right in succession. At this food festival, you can try a little bit of everything, all while being serenaded by various musical acts. 3. If you are so ready for fall… Get lost in a corn maze at Szalay’s Farm and Market. Szalay’s is located in Peninsula, and open from 9 a.m.-7 p.m. daily. After walking through tons of corn, you can try some yourself at the Szaley’s market. They also have freshly squeezed lemonade and iced tea, produce from the farm, and ice cream. It’s the perfect way to get into the spirit of fall. 4. If you are so ready for fall part two… What says fall better than a corn festival? Go to Downtown Willoughby’s Corn Roast and sample the best corn from across the region. The event takes place September 1-2 from noon-10 p.m. There also will be food from some great Cleveland restaurants and live music from local bands for entertainment. 5. If you live for the burn… Kick your taste buds into high gear at the Totally Kosher Rib Burnoff. This paradise for rib fanatics is on Monday September 3 from noon-4 p.m. at the Gross Schechter Day School. This festival is fun for the whole family with face painting, a video game truck, and of course mass quantities of delicious ribs. 6. If you love a good toast… Say “prost” at the Cleveland Oktoberfest, taking place August 31-September 3 at the Cuyahoga County Fairgrounds in Berea. The event features food and fun for all ages, including a kids’ activities. 7. If you are an adrenaline junkie (who also loves funnel cake)… Go to the Great Geauga County Fair. The fair is in town from August 30- September 3. The fair has it all, from thrilling rides and carnival games to live music and fair contests. 8. If you love the game… Take advantage of one of the remaining home stretches the Cleveland Indians will have this year (during the regular season, that is). The Tribe hosts Tampa Bay August 31-September 2 and Kansas City September 3-5, so there are many opportunities to root for the home team. Make it a family outing by visiting the Kids Clubhouse at Progressive Field. 9. If you want to do something good for your mind, body and soul… Bring your yoga mat and join hundreds of other Clevelanders at Believe in Cle in a giant yoga gathering at the Rock and Roll Hall of Fame. This event will calm you down from the work week and ensure you can experience your Labor Day weekend stress-free. Plus, you get to meet a community of fitness lovers from the Cleveland area. Make sure to pre-register so that you don’t miss out on the yoga, Rock Hall experience, and fun after party. 10. If you’re into planes and family fun… Attend the Cleveland National Airshow on September 1-3. Watch planes do tricks up in the sky while enjoying the family-friendly festival on land. 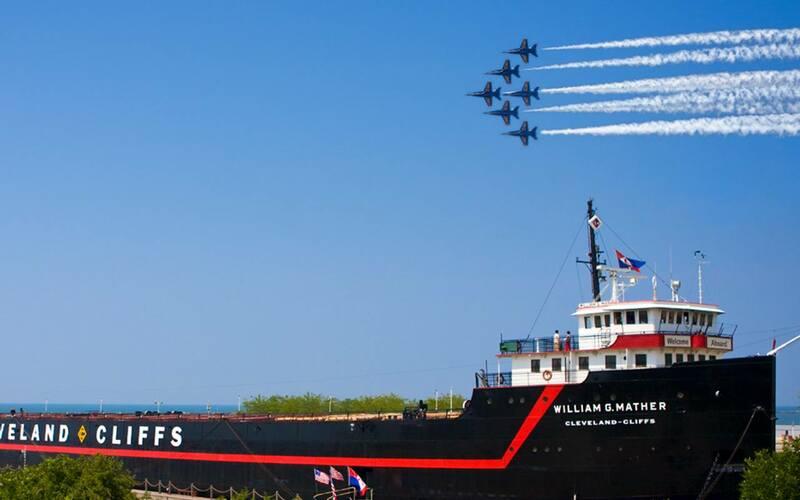 This event is at the Burke Lakefront Airport., but you’ll likely be able to watch some of the action from various downtown spots throughout the weekend (one example is the Air Show Deck Party aboard the Steamship William G. Mather, docked outside the Great Lakes Science Center).